Whether for environmental, health, or ethical reasons, the past few years have seen a dramatic shift in consumer attitude toward learning more about where their food comes from. This is especially true when it comes to animal products. Consumers are increasingly seeking out smaller, local farms focused on raising their animals humanely and sustainably, rather than depending solely on supermarkets for food. Sumas Mountain Farms, run by Trevor and Kelly Newton, is an example of that type of farm. 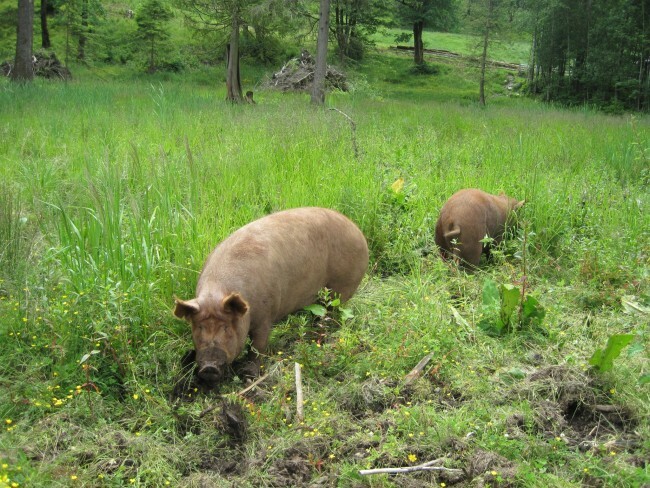 Located in Abbotsford, just minutes from the city centre, they raise pastured chickens, pigs, and grass-fed cows. Since starting their farm in 2005, they have seen demand for their products steadily grow. One of the few farms in B.C. offering grass-only beef, Vancity Buzz spoke with the Newtons to learn about why that’s an important distinction. It seems that people are increasingly interested in knowing more about the food they’re eating, particularly meat. Have you noticed this with your customers? The Lower Mainland is home to a growing number of people who are not only health conscious but also interested in every aspect of their food, from its nutrient density, to how it gets produced, to where it comes from, to its impact on the land and the animals. These folks view their food as more than simply food, per se. I think it’s more than a fad, more than just a temporary phase. So we try to provide families with food that is raised with a view to the health of people, animals, and the planet. We’re grateful to have customers who are willing to share this view. A lot of beef products are labelled “grass fed” now. What is the difference between “grass fed” and “grass fed and finished”? You’re right to point out that there’s a distinction between simply grass-fed, and grass fed and finished. Most people may not realize that nearly all beef in Canada is initially raised on grass but then is moved to a grain-based feed lot operation. Sometimes marketers claim that their beef is grass-fed but, in reality, the cow only ate grass for the first portion of its life. When a cow is given only grass for its entire life, then it can be referred to as “grass fed and finished” or a “grass-only” beef cow. When cows only eat grass, their growth is slower than when they are fed grain, their fat is entirely different and much healthier, they are healthier animals, and the food they produce is healthier for us. Cows are not designed to eat large quantities of grain; rather they are ruminants and are meant to primarily eat grass. When we acknowledge this and are willing to accept the natural design of the animal, then everyone is healthier. There are still relatively few farms in B.C. which are grass-only beef farms, but there are some. 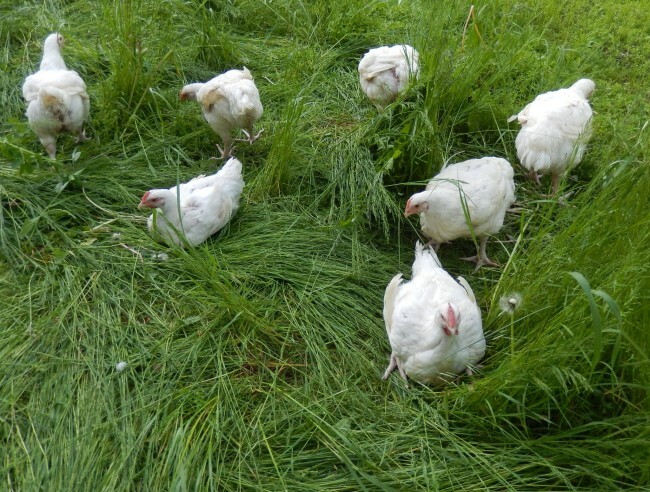 To our knowledge, we are the only farm in the Lower Mainland which is grass-only, but also certified organic and certified humane through the BCSPCA. With the slower growth of the animals, what additional costs do you face? What are some other reasons organic, pasture raised animal products are more expensive? When cows only eat grass they take much longer to grow, resulting in some additional costs, such as independent third-party audits each year to ensure compliance with codified organic standards. Plus, during the winter season when grasses are dormant, the cows need to eat dry grass (hay), which must be certified organic. This is, naturally, more expensive than regular hay, since the hay farmer who produced it, did so without the use of chemicals, glyphosate, GMO-seeds, or any of the other toxic crop enhancers which conventional farmers use. Certified organic is the customer’s only way to verify that their food was produced in a holistic and sustainable way, but even that is not enough. That’s why we’ve also added humane certification through the BC SPCA, so our customers know that we are inspected by an independent body to ensure compliance with humane standards. These extra steps result in added costs to us and, therefore, to our customers. But, in our view, these things reflect the true cost of responsible and sustainable food production. Now that we’ve learned about the additional costs, what are some unique challenges your farm faces versus a conventional farm? We really are very grateful to live in such close proximity to such an amazing market of interested customers. Many organic farmers struggle with lack of access to a good market because they are in remote regions where markets are not large enough to sustain their operations. Being close to Vancouver is helpful to us because there are so many folks who are thinking about these things: organics, humane treatment, sustainability. I think right now it’s important for more people to be aware of how their food is raised and the impact it has on the health of people, animals, the planet, and future generations. I’m encouraged that articles like this one will be read by people who will take the information and use it to responsibly inform their food buying decisions.